Siri, drive us Darsham-wards. Maybe in a few years, p'raps. Meantime, EcoAndy's at the wheel of his GeeWhizz on a white-hot day. We're following the road into Yoxford past that go-ahead pub on the right, you know, the one that banned smoking back when smoking was a thing? Anyway, there on the left stands a sign calling our names, if one of us answered to "Tea" and the other to "Room". Darsham can wait as we lurch left. Not sure where they went, but we were aware that the nice ex-pub couple who used to run the Post Office stroke cafe had moved on. 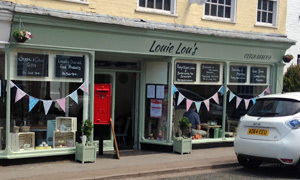 Well, Mrs Goggins has had a fancy Farrow & Ball respray and emerged as Louie Lou's, bunting and all, with just an old-fashioned postbox remaining outside. Blackboards boast of Paddy & Scott's coffee, Butterworth tea, locally sourced food products and fresh bread, all of which are on offer from the counter in the corner. Everything's freshly made, says the beaming busy-busy lady, so please excuse the wait. That turns out to be a fair warning. Then again, we're lucky to get a table since this room is rammed, hence the perfectly understandable delay. Friday's obviously the day to lunch out with the ladies. We've opted for humble tuna mayo and bacon/brie sandwiches, both good 'n' tasty when they eventually arrive, though there's also caesar salad, scampi, posh sausage rolls, etc. There's ample time to sip some "deliciously tart" Midsomer rhubarb juice, as favoured by John Nettles, ogle the "sleek and chic" gifties, and for Andy of Assisi to rescue a trapped bumble bee with a laminated menu card. That lad's a saint, I tell ya. Also to be noted is that they're open Sundays, a smart move, and they serve breakfast too. There's no loo yet -- use the church! -- though no doubt that'll be rectified before you visit. As per the Pear Tree, we can't do dessert (our mins are up) but we can take away a decent P&S latte alongside an outstanding mocha cupcake. Lots of luck and a long life to Louie Lou's. If it was a car -- Lagonda Taraf. If they were passing by -- Lulu.